Location: 53 degrees 32 minutes North, 113 degrees 30 minutes West. NOTICE: If you enjoy the server or like this update, please write us a review on RateMyServer, or refresh your current review! A high rating encourages more people to play on the server, and generally a higher population means more fun for everyone! We would like to introduce the allowance of a modified version of the 3rd party program RCX on Ragnarok Frontier. Although we cannot offer any sort of warranty with this program, we will provide a limited amount of instruction/support for it. This update is completely optional: it is being offered to increase player enjoyment. If this is of interest to you, see the below! 1) RCX requires Microsoft Visual C++ to function. If you do not have this program already, it can be downloaded from Microsoft, here. Ensure you download the version that is applicable to your version of Windows. 2) Download our self-extracting RCX file by clicking here. 3) Run the self-extracting .exe file, with your main Ragnarok Frontier directory as the destination folder. This should create the folder "RCX" within your main Ragnarok Frontier folder, and add a shortcut to RCX.exe in your start menu. 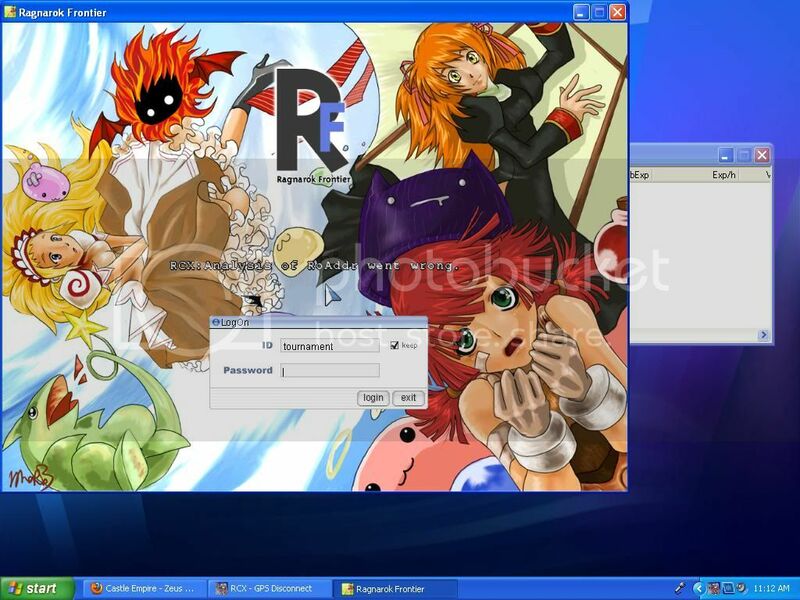 4) Run the file "RCX.exe", either from the start menu shortcut or from within the RCX directory in your Ragnarok Frontier folder. The window that pops up can be minimized; doesn't matter. RCX.exe must be started before Ragnarok Frontier is started for it to attach. 5) Run Ragnarok Frontier normally. The first run may take some time for everything to add & process; once it does subsequent runs are faster. If you are using the modified version of RCX provided for Ragnarok Frontier, you can use it and customize it as you like (short of replacing the entire RCX.ini file with a non-RF version) and you should never run into any restriction problems. It is not possible to run into these restrictions with the modified version we are providing unless you are REALLY trying. However, if you choose to use an unmodified version, RCX by default has three problematic functions: "Groupie", "CharConfig", and "AccountCollector". The "Groupie" and "CharConfig" functions are detected as bots, and suspensions for botting will be issued if these functions are used. The "AccountCollector" function is not detectable, but use of this function is a serious security risk for your account password and username, as it stores the information locally and unencrypted. Again, you do not need to worry about these functions if you are using the Ragnarok Frontier version of RCX, downloadable above. If you are using an unmodified version, we recommend you replace it with our version. In keeping with the overall look and feel of RF, the version of RCX is being offered with minimal features enabled by default for a clean, non-busy look. However, you many modify any of the information in the RCX.ini file as you wish. We recommend you back up your RCX.ini file before any large modifications. Do not make modifications to the RCX.ini file while RCX is open, or the changes may be reverted when RCX is closed. Ctrl + 0 (zero) - Opens the RCX Options Menu (does not work correctly for some users; if you cannot change settings here then all modifications must be done via the .ini file using the instructions below). Ctrl + X - Adds a green border 9 cells around your character. Ctrl + B - Adds the Bowling Bash / Gutterline grid. Values under the [KeyConfig] option can change what hotkeys do what effect. Unfortunately, the method for adding additional hotkeys for options not already shown is unknown. This option makes any terrain obstacle that would be covering your character (trees, walls, etc.) translucent while your character is behind it. Detection is not perfect, and sometimes it makes ground terrain detail translucent as well. The line "Opaque=0" in the RCX.ini file dictates if this feature is enabled or not. 0 is disabled and 1 is enabled. To show any exp displays at all, find the line "EXPTIMER=0000" in the RCX.ini file and adjust the value to the duration you want the exp display to be active for after killing a monster; eg. 5000 = 5 seconds. A miniture Exp window is displayed at the same time. How to disable this from appearing is unknown, but to make it appear at all times or change where on the screen it appears find the following lines and adjust as per the instructions immediately above them. Values under [MOBInfo] controls the fonts used for monster hp and monster stats. Additionally, the following two lines (near the bottom of the .ini file) control where the monster hp is relative to the monster and how (or if) additional monster info is displayed. The exact hex codes for what configuration are currently unknown. Recommend updating via the RCX menu, if available. Note: Monster hp as displayed by RCX does not come from the game itself, the way the skill Sense gets it. Instead, RCX uses an internal database and adjusts hp based on what occurs on your screen. If the monster leaves your field of view and comes back, it will show at full hp again. 1) Values under the [SkillTimer] option determine if it is enabled/disabled, and allows for font modifications. 2) Values under the [SkillTimerFlag] option dictate which buffs are displayed under what conditions. All of these are 4-character Hex code. By default for RF, most buffs are only displayed if they affect you or are cast by you and most ground-based effects are displayed when cast by any player. Example: To make Bless appear over any person (but not monster) you cast it on, find the skill AL_BLESSING and change the hex code from 0x1111 to 0x1117. To include casts on monsters, change it to 0x111f. It you want to see it on absolutely anything cast on your screen, change it to 0xffff. 3) Values under the [SkillTimerCountDownTick] option dictate at what point a skill timer changes from being yellow to refilling as a red bar, in thousandths of a second. 4) Values under the [SkillTimerMode] option dictate how you would like the skill timer displayed. The value of 1 means that it will display on the right side of the screen with the buff icon (if available). The value of 0 means that it will always display over the character. Note that buffs without an associated icon or buffs on other people must always be over the character, regardless of this setting. * For the aftercast delay timer, the wait time is based on base delay only. Equipment and skills that reduce after-cast delay, such as Magic Strings, will not affect the visual timer even though they will still affect your true aftercast delay. * Similary, for status effects the time indicated is the base time only: the displayed time remaining is not adjusted based on character stats/MDef. * Timers are only based on information known to the client. When changes happen the client is not aware of (ie. offscreen recast), the timers can potentially be misleading or incorrect. * In WoE these are disabled and cannot be enabled. Skill timers are still available in other PvP settings, such as Battlegrounds. These provided colors on the ground that can help identify where effects are, even if the /effect option is off. 1) Enable/Disable. Find the line "M2E=0" (near the bottom of the file); to enable this change this to "M2E=1"
2) Colors. All colors are customizable and are in the section titled [M2E]. Find the ground effect that you want. There should be a line under it that reads "Skill####=0x########". These last 8 characters are the ones that should be modified if you wish to change the color of an effect. They are in Hex code, with 2 characters for each type of color parameter (in order): Alpha, Red, Green, Blue. This list only includes the modifications that work and seem like they may be useful. Although you may modify other options, we do NOT provide support if options other then the ones listed above are modified: some of the other options conflict with or otherwise do not play well with other customizations we have. RCX is very handy to have for the gutterline paint. Indeed, I also like the buff time-left bar. WOW. mind = blown. O.P. This is an awesome inclusion; super useful. Ok so i thought i would give this a try, I downloaded the proper microsoft file and installed it, then i downloaded RCX and ran it before starting Frontier in the order than you state, and when i get to the login screen i get this..
double check that you installed RCX into the correct folder which holds Ragnarok Frontier. djuang is correct in the most likely explaination: the path to target using the installer needs to be your main RF directory. If it's a new folder within your main RF directory or another folder entirely then our pre-programmed pathways will target incorrect locations and RCX won't attach right. It is not the only possible explaination though. If you still have problems getting it to work, please send me a forum PM and I will assist working through your specific case. Thanks i got it to work once it was all in %appdata% Ragnarok Frontier, appreciate you're help. Edit : Could you add more on how to use it because im lost.. I cannot get any of the commands to work but it IS running now, How do i connect it and such? Why no skill timers in WoE? Because of the competitive nature of WoE, timers and several other aspects of RCX are disabled on those maps to prevent any significant advantage being given to those with RCX relative to those without. Thanks for introducing us to such useful tool and allowing us to use it Robert!